The term “VR” encompasses it all. The platform, the technology, the medium, the content, all of which are experiencing a rapid development, rapid failure period during which we have no agreed upon procedures or format. Currently we have just a few key players developing different pieces of hardware with different capabilities and its yet to be seen whether they will continue to co-exist, or whether one will succeed in setting a standard, going on to either monopolize the hardware development or license technologies out allowing dozens of VR hardware brands as we have manufactures of TVs. But while most are focused on the technology, be it on the hardware or software side, I’m far more curious about two less often discussed aspects of VR that it faces as the result of it (at least partially) being a new medium though which information and entertainment can be delivered both in passive and interactive forms. Those two aspects are the increasing sophistication of the audience / users in the form of “VR-literacy” (consider the term coined! ), and the development of a language for the medium. For some context, I’d like to take you back in time as you see, we’ve been here before. No, I’m not talking about the Virtual Boy. I’m actually talking about Auguste and Louis Lumiere (who’s last name appropriately translates as ‘lamplighter’) who devised the Cinematogrphe, both a camera and projecting device. They exhibited first at the Grand Café on 28th of December 1895 in Paris. 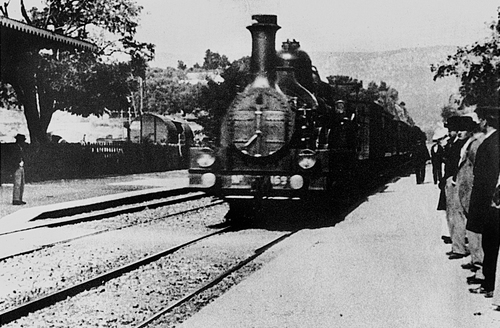 Their film, “L’Arrivée d’un train en gare de La Ciotat” (Arrival of a Train at La Ciotat) alarmed audience members. G.R. Barker, a journalist wrote “The station is apparently empty when the train is seen approaching and gradually gets nearer and larger until the engine passes where we are apparently standing, and the train stops, the guard comes along, passengers get out and in, and all is real! There were even reports that audience members shrieked in terror, ran for the doors, some even fainted, though it’s hard to deduce how accurate those reports were. Regardless, there’s no doubt that in these early days of film, audiences were being exposed to a new medium that offered a window into a new reality which they didn’t quite know how to process. They were as children learning to walk, learning how to consume this new medium of streaming information and what role it could play in their lives. Compare those audience members to those who inhabit a movie theater today. We now have color and sound, but the medium itself and the way it’s presented is essentially the same. The audience member has changed drastically however. They’ve grown up with the screen in theaters, at home, at work, they’ve watched “behind the scenes” featurettes, their favorite actors discussing their latest role on a chat show, the facade has been lifted and many today would find “L’Arrivée d’un train en gare de La Ciotat” laughable. Today’s audiences are extremely literate in film, TV and video games. Children growing up today even expect all screens to react to touch. Yet we are not VR-literate. I suspect the VR experiences you try in these early days which are to some degree designed for a audience that isn’t VR-literate, will fast become outdated, “retro”, perhaps some even laughable in the assumptions they made about how audiences and users would interact with these devices or in the language they used, which brings me to point number two. Early filmmaker George Melies began by making scenic scenes. When filming one in the Place de L’Opera in Paris, his camera jammed. It resumed filming a minute later during which the people, buses, vehicles had moved. Projecting the film having joined the break, he suddenly saw an bus changed into a hearse and men into women. The trick of substitution, called the trick of stop-action, had been discovered. 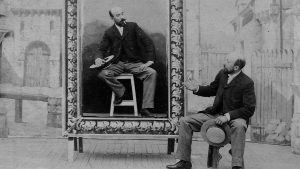 Melies want on to become the foremost producer of “Trick Films” and pioneered numerous practical effects used in film. 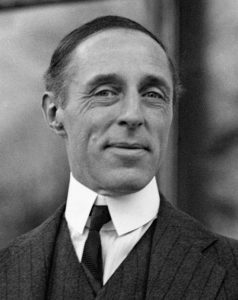 Similarly, D. W. Griffith is credited with having developed numerous film techniques such as the close-up. It’s strange to think of the close-up shot as an invention of sorts, but indeed there was a time when it was first used. It proved effective, and so it saw repeated use and became part of the language of film which we take for granted today. Things as simple at a cut from one perspective in a scene to another. A cut to a different location. A cut in time to a different period. Flashbacks in time. Hearing a character’s inner thoughts expressed in their voice while their lips aren’t moving, the idea that shooting a car on its fuel cap will cause it (most likely) to explode immediately in a ball of fire! All of these conventions had a moment in which they were first used, and have over time become part of the language of film. I don’t mean to say that a language is fixed and not malleable as the language of any given medium can change over time, often influenced by technology and new creative voices. You can certainly also break the rules and disregard the language for creative effect. All this is simply to say that the language of a particular medium can be thought of as the rules by which the vast majority of content adheres to to be immediately effective and comprehendible. At this point, I believe VR is in the very early stages of developing its own language while leaning heavilly on the existing languages of film and video games. While so much energy is being put into defining the hardware side of things, its natural that VR’s first experiments would be extensions of existing mediums such as video games or film, taking these existing content forms and placing them in this new medium, making them more “immersive”. And it’s clear already that even simply as an extension of those entertainment forms, VR already offers unique tools, opportunities and challenges. But when you accept that VR isn’t merely an extension of existing technologies, but instead a new medium, then the mind then boggles when you consider what VR could not just be extended to, but give birth to. I find it hard to think of an industry that might not have some use for the potential of VR. As we move further along the VR trail, its language will develop. It’s already being written in the do’s, the don’ts, the what works and what doesn’t. What’s the most effective method of control, movement, audio feedback? Should experiences be 1st person, 3rd person, no-person? What sorts of narrative interaction work within VR? How do you communicate signals? How do you accommodate for the outside world and interrupt and experience if necessary? All these elements go hand-in-hand. By easing people into VR via familiar forms such as video games and films, you introduce them to a new medium in a way they can at least partially comprehend as the content at least is a known quantity. As you start to create an increasingly VR-literate audience, you make room for more unique experiences and tools that could only exist in VR. It’s then that VR will lean less on the established languages of film and video games and instead develop its own. It’s not very often we see the birth of a new medium where the creators and consumers both are grappling trying to figure it all out. I find it fascinating and I can’t wait to see how the language of VR evolves and develops as we become more literate consumers of the form.